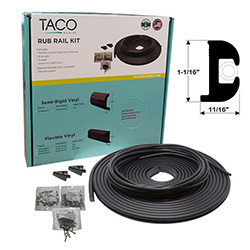 Get back $50.00 with purchase of this Taco rub rail kit. See rebate link for details. Taco Marine supplies the most complete selection of Aluminum, Rigid or Flexible Vinyl, and Stainless Steel boat rub rails and boat rub rail inserts for marine applications. Convenient kit includes rub rail, (in a continuous coil for one piece installation without seam) insert, end caps where applicable, screws and installation guide. You can replace your rub rail with a factory replacement style or a completely different look. Regardless of the material originally installed by the builder of your boat, feel free to choose the material and style you desire.